I’ll never forget what it feels like to bring home a newborn from the hospital. On one hand, it’s the most exciting thing ever. On the other hand, however, it’s one of the scariest things as a new parent! There’s so much to do, so much to remember, and so much at stake. You hold the responsibility for a whole human being! It’s now your job to make sure they’re safe, healthy, and sound. This tiny, ridiculously fragile seeming, little person. Amongst the many decision that must be made, what to put on their little skin is somewhere near the top. Babies skin is so much more sensitive than adults, and the last thing you want to do is to irritate it, causing your poor little one to have discomfort. It’s even worse when you discover that your precious little one is suffering from eczema. Eczema is hard enough for adults.. but on the skin of a baby it seems much worse.I learned early on to take special care with the products that I choose for them. That’s why I’ve been using AVEENO on them, from the very beginning. With more than 30 million people in America suffering from the discomfort and itchiness associated with eczema; I wanted to be sure I did my best to make sure my child didn’t have to experience that. 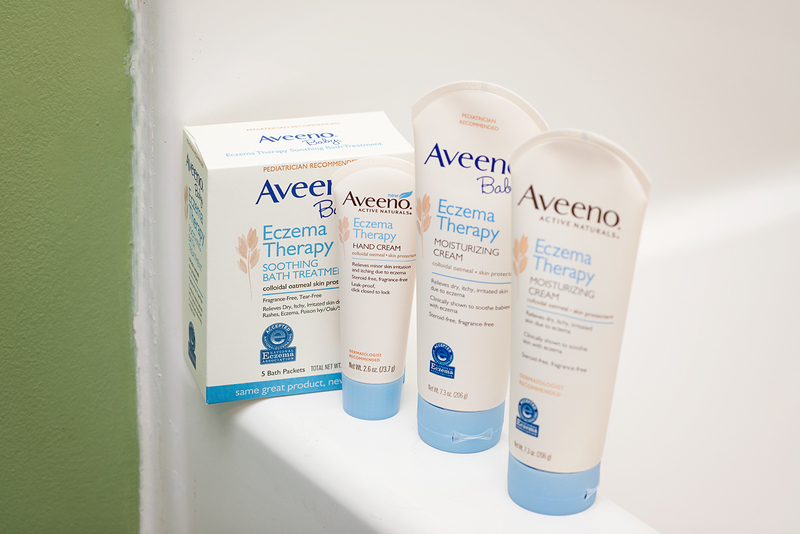 AVEENO Baby Eczema Therapy as well as the regular AVEENO Eczema Therapy are both formulated with ACTIVE NATURALS Colloidal Oatmeal that are fragrance-free, steroid-free, and hypoallergenic. When they’re used properly as a regimen, they can help break the cycle of irritated skin. I’d do anything and everything I can to keep my little one comfortable. Particularly since dealing with eczema is no walk in the park. The discomfort, itchiness and daily dry skin can be unbearable. While there isn’t any cure for eczema, the discomfort and be eliminated by a properly daily regimen. AVEENO Eczema Therapy and Aveeno Baby Eczema Therapy are the key to making that possible! What was your biggest fear when brining baby home? Comment below!